Reflections on the history of my Superior Canal Dehiscence symptoms, its diagnosis, and my daily life with SCDS. As I’ve noted a few times in previous posts, I’ve been undergoing vestibular therapy since August. For most of that time we had no real idea what was wrong with my vestibular system, but we were sure that it was pretty effed up. I was also experiencing muscle weakness, a ton of stress, and chronic fatigue. The balance retraining exercises helped me immensely. They were often frustrating and exhausting, which I personally found a bit demoralizing, as at various points in my life I have competed as an endurance athlete — running marathons and racing bicycles over long distances. So, to be worn out by standing on one foot for thirty seconds kind of broke my heart and pissed me off. But, like with anything I stick with and practice a lot, I improved. My therapist is a goddess. This is true. And the biggest impact she made on life — keeping me functional — involved craniosacral therapy and massage. Craniosacral therapy is essentially a very gentle massage of the skull using a soft touch on certain pressure points. It’s not in the slightest bit painful — in fact, I sometimes fall asleep because it is so relaxing. This therapy functions to relieve pressure in the skull, which for me was a HUGE problem in my undiagnosed SCDS. My vertigo improves, the pressure in my ear and skull decreases, and my stress level goes WAY down. And let’s face it, SCDS stresses the body in dozens of ways. Eventually, my neck and upper back were so tight and contorted from the strain of trying to stay upright that she began a massage process after the craniosacral therapy, and within two visits my headaches and back pain had disappeared. I went for therapy twice a week for about five months, and was able to work, drive, travel, and have some very good days despite the SCDS. And after a bad day with terrible symptoms, the therapy would set me straight again. Now I go as needed. I CANNOT recommend it highly enough. This is a maintenance process, not a cure. And, without great insurance, it could certainly be expensive. Fortunately for me, I only had to pay about $12 per visit — which is basically made up by the coffee and bourbon I can no longer drink. If you happen to be in the Chicago area suffering from symptoms of Superior Canal Dehiscence Syndrome or any other vestibular problem, I urge you to give her a call. This entry was posted in Reflections and tagged craniosacral therapy, SCDS, Superior Canal Dehiscence, vestibular therapy on January 10, 2014 by Brad. 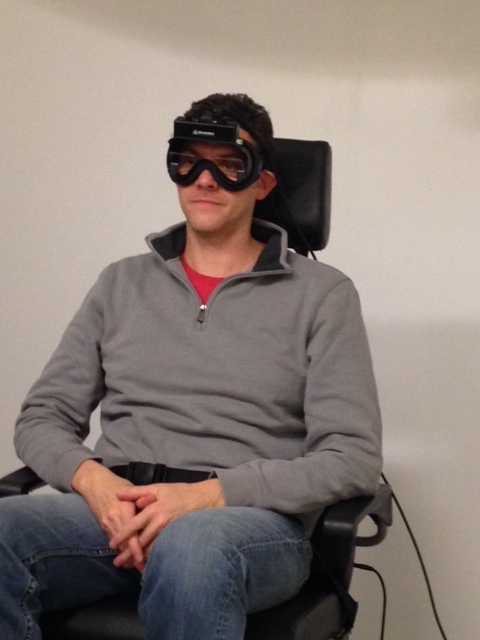 This big dork sitting in a rotating chair wearing funny goggles to measure the movement of my eyeballs as I spun. We received the first real snow of Winter on 11/11/13, when my wife and I trekked into downtown Chicago to visit with Dr. Timothy Hain at Northwestern. Six hours of testing finally revealed a likely answer to a then five month quest for answers to my symptoms. The VEMP test on my right ear was off the charts and a very strong indicator, as was low frequency hearing loss, pulsatile tinnitus, measured and documented vertigo, and the fact that a tuning fork placed anywhere on my body would only hum in my right ear. It would take a high definition CT Scan to finally prove it, but we had a solid answer: Superior Canal Dehiscence. This entry was posted in Reflections and tagged brad riddell, Chicago, dizziness, Dr. Timothy Hain, Low-frequency hearing loss, Northwestern, Pulsatile Tinnitus, SCDS, Superior Canal Dehiscence, VEMP Test, Vertigo on January 9, 2014 by Brad. I remember the Outer Banks, taking my daughter fishing for the first time, and being completely unsteady on my feet crossing the pier. The planks seemed as if they were moving. The surf nearly knocked me over once we got into the water, and negotiating the sandy beach left my legs burning and exhausted. I remember going the opening game of the NFL season to cheer on my (disappointing) Bengals as they played the Bears at Soldier Field. Our seats were very high. I didn’t move from my seat during the entire game for fear I’d fall over. I couldn’t even wear my prescription eye glasses because they caused me feel unsteady. I remember going to a RUSH concert where the Blackhawks showed up with the Stanley Cup. If not for earplugs I never would have survived the concert. I felt swooney from the noise. I remember cheering my Kentucky Wildcats as they opened the season against Michigan State in Chicago, and between my clapping and all the shouting in the arena (they lost), I felt my whole body was vibrating through that night and into the next day. I remember going for a jog one week after running 6.5 miles in an hour, and stopping at the end of the block, turning around, and walking home because I was already exhausted. I remember not being able to clearly understand what the University Provost and my colleagues were talking about three feet away, because I couldn’t filter out the noise. I remember falling into my garden, destroying a broccoli plant, and fearing I had broken my hip. I remember taking naps under the desk in my office because my computer screen would set my head to spinning so bad that I had to rest every 15 minutes. I remember the horror of quitting caffeine and the sadness of abandoning bourbon. I remember breaking down in tears upon my first visit to the vestibular therapist. She’s a tiny little lady, and I’m a 6’4″, 200 lb man, and when she did strength tests on me I could offer no resistance. I remember not being able to remember how to put my little boy into his car seat. I remember trying to write and finding that I had no words. This entry was posted in Reflections and tagged brad riddell, dizziness, hyperacusis, Low-frequency hearing loss, SCDS, Superior Canal Dehiscence, Tullio, Vertigo on January 8, 2014 by Brad. A friend of mine who specializes in Search Engine Optimization told me that roughly 1,300 people web-search the exact phrase “superior canal dehiscence” each month. That’s not many people given the web-surfacing population of the planet. 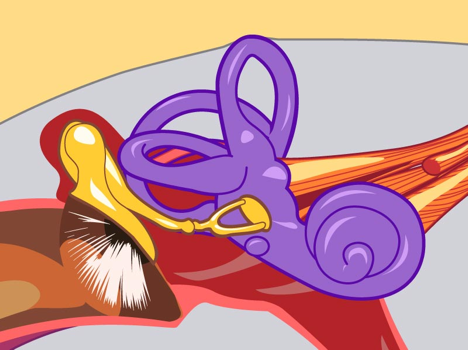 What needs to happen, and I’d like to help if possible, is that when people google the most common SCDS symptoms like “pulsatile tinnitus,” or “I can hear my eyeballs move inside my head,” they are lead to good information that might allow them to investigate this disorder. People need to be able to connect the dots. Clearly everyone with tinnitus and low frequency hearing loss does not have SCDS, but if they also have autophony and some degree of vertigo, they just might. If people could see the symptom they searched appear along with the others that define this syndrome, perhaps they’d be able to get doctors to take notice and dig deeper. This entry was posted in Reflections and tagged brad riddell, Low-frequency hearing loss, Pulsatile Tinnitus, SCDS, Search Engine Optimization, Superior Canal Dehiscence, Vertigo on January 6, 2014 by Brad.